16' Principal notes 1-12 are electronic. 16' Rohrfloete notes 1-12 are electronic. Great Gedeckt 8 notes 1-12 electronic. Pedal Mixture 2 2/3’ rank independent, combines with pitches from Octave 4-2 to make III-IV Mixture. The Organ at the Granville Federated Church was designed to meet the challenges facing this small but musically sophisticated congregation. 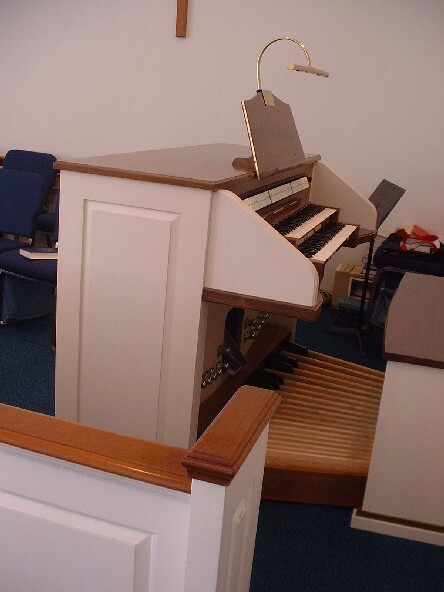 Early on in the process of seeking a replacement for a well used and unreliable electronic instrument from the late twentieth century, the Organ Committee determined that a pipe organ would be ideal for their sanctuary but that costs seemed prohibitive. Thanks to the generosity of one man, the prospect of a well crafted pipe organ became a possibility. Russell & Co. Pipe Organ Builders was charged with the task of crafting a new instrument of sufficient size to be musically versatile, reasonably compact and tonally satisfying while remaining within an extremely limited budget. 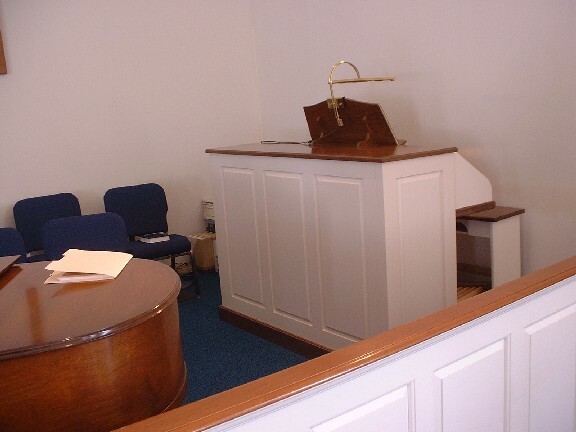 In order to accomplish these goals we designed a simple, yet elegant, painted case to house the organ which also provided the swell enclosure, structural needs and wind delivery system with minimum use of materials. Electric action is employed, controlled by the Syndyne LS5600K Organ Control System. The organ blower and the two reed stops are pre-existing material from our stock. The Trumpet stop, made by Trivo in 1976, is a medium scale reed with parallel shallots and voiced with a fairly controlled tone. The Fagotto-Hautbois stop is from a 1930’s era Estey organ which was revoiced for low pressure by David Broome in 1976. Electronic bass voices were used to further reduce costs and to enhance versatility. The organ is configured so that organ pipes may replace the electronic voices if additional funds become available. New flue pipework with custom variable scales was fabricated in our workshop to provide a well balanced ensemble along classic lines. The façade and bass pipes are of zinc and the remaining pipes are made from 94% lead alloy voiced to produce a clean silvery tone without harshness. Voicing and tonal finishing was done by Allan Taylor of Feeding Hills, Massachusetts, a close friend of the major donor, in consultation with Stephen Russell who developed the tonal design and pipe scales. Though the instrument makes significant use of unification to enhance versatility, the stop list is designed to minimize the overlap of pitches found on typical unit organs. 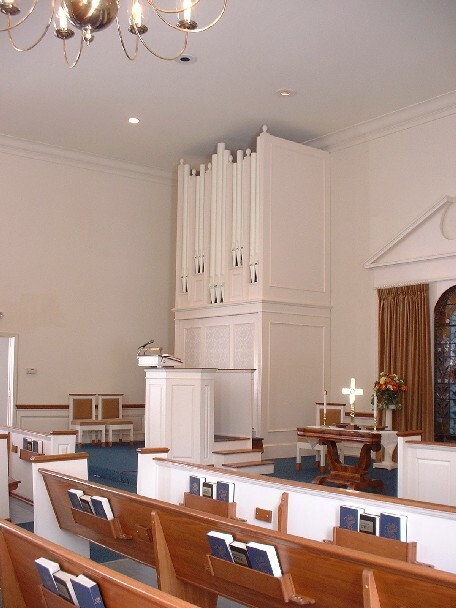 The variably scaled pipework, elegantly voiced, gives the instrument a considerable range of color and power, thus meeting the varied musical requirements of choral accompaniment, leading congregational singing and the performance of a wide variety of organ literature. Of special note are the broadly scaled Swell strings which provide a generous warmth and body to the smaller ensembles.